Weekend getaways or long trips, we all love a little bit of sunshine and waterfalls in our sojourns. Looking for a short trip that includes waterfalls just five hours away from the city? We got you covered. Here is our list where you can go on a short road trip, hit up some waterfalls, dip your feet and unwind like a boss. Located at a 5-hour drive away from Hyderabad, Bogatha Waterfalls abounds in greenery with an epic view of hills. Adrenaline junkies can rejoice as reaching these waterfalls require trekking, and there are a plenty of water activities. Often regarded as the Niagara Falls of Telangana, Bogatha attracts a lot of crowd during the weekends. While you’ll find a lot of people swimming in the water, we advise you exercise some caution before taking a plunge, as it has several rocks. Go here after the monsoons or from June and you’ll witness a large flow of water. If you have visited Nagarjuna Sagar Dam, you might have checked out Ethipothala also off your bucket list. Located 163 km away from Hyderabad, a visit to Ethipothala is nothing short of a trek. You have to climb down nearly 80 feet to reach the viewing platform. Plus, there is a little crocodile sanctuary at the foothills of the waterfall as it forms a lagoon which makes for a perfect breeding ground. So, if you want a quick getaway, and say hello to them ‘crocs, get here. 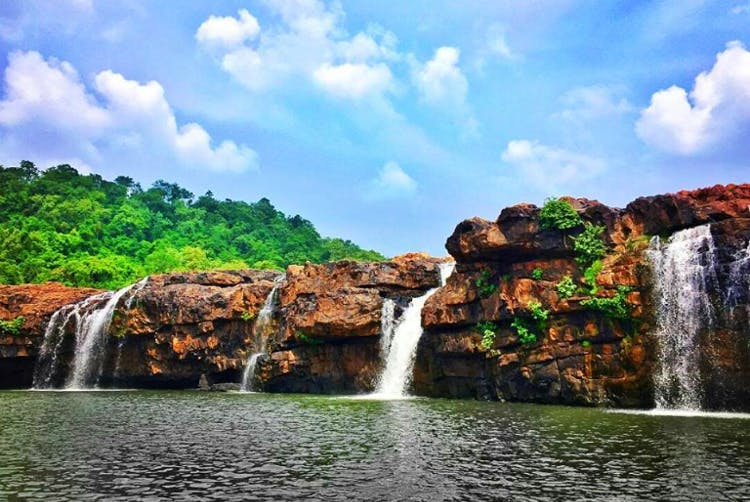 At 173 km away from Hyderabad and hidden in the close-packed Nallamalla Forests is a waterfall that can make you squeal like a child. Mallela Theertham Waterfalls is located near Srisailam and has a simple hike where you have to cross around 380 well-laid steps to reach the waterfall which is at the height of 150 feet. You can take part in activities like the river crossing. If you’re looking for a day of solitude in dense greens, we recommend this. The Monsoons get mucky, and the Summers are dry, so, the best time to visit it is between October and February. Kuntala Waterfalls are the highest waterfalls in Telangana and are nestled in the dense forests of Adilabad. To reach Kuntala, you might have to hike 400 steps downwards from where you can see the entire view of the waterfalls. It is said that these waterfalls have gotten their name from Shakuntala as locals believe that King Dushyanth and Shakuntala fell in love here and that she was fond of these waterfalls. Now that’s a story worth visiting the waterfalls for. So, go here with your squad and have a memorable weekend. Located 200 km away from Hyderabad, Bheemuni Padam is a sight not to miss if you’re visiting Warangal. It is said that the water here flows through a natural rock formation that’s in the shape of Bheema’s footprint, and hence the name! While you can check out the caves beside the waterfalls, we highly recommend visiting the waterfall during sunrise as the water shines in rainbow colours.